[S137] Elisha Scott Loomis, Joseph Loomis, Page 145/Item 324. [S137] Elisha Scott Loomis, Joseph Loomis, page 163, item 324. [S137] Elisha Scott Loomis, Joseph Loomis, page 205, item 845. Loomis lists Timothy's marriage date to Anna as 5 Mar 1781, obviously an error, unless all the children are from an earlier, unrecorded, marriage. [S137] Elisha Scott Loomis, Joseph Loomis, Page 145/Item 325. [S137] Elisha Scott Loomis, Joseph Loomis, Page 163, Item 325. [S137] Elisha Scott Loomis, Joseph Loomis, Page 145/Item 326. [S800] Richard C. Roberts, "Loomis Gravestone Carvers." [S137] Elisha Scott Loomis, Joseph Loomis, page 163. [S137] Elisha Scott Loomis, Joseph Loomis, Pages 163, 207; Item 858. Sarah Loomis was born on 14 June 1726. She was the daughter of Ensign John Loomis and Ann Lyman. Sarah Loomis died on 14 July 1726. Ann Loomis was born on 12 June 1727. She was the daughter of Ensign John Loomis and Ann Lyman. Ann Loomis died on 11 November 1734 at age 7. Elizabeth Fowler was born on 10 March 1688 or 1689. She was the daughter of Jonathan Fowler and Elizabeth Reynolds. Elizabeth Fowler married Thomas Loomis, son of Thomas Loomis and Sarah White, on 8 January 1713. Elizabeth Fowler died on 18 July 1742. Hannah Hunt married Thomas Loomis, son of Thomas Loomis and Sarah White, on 20 December 1743. Hannah Hunt died on 10 June 1758. Thomas was in the Lexington Alarm. He and Susanna had 11 children, all born in Lebanon. [S137] Elisha Scott Loomis, Joseph Loomis, Item 329. [S137] Elisha Scott Loomis, Joseph Loomis, pages 145, 163. [S137] Elisha Scott Loomis, Joseph Loomis, pages 163, 207. Information on James and Electa and their descendants is from Phyl Stancill, stancill@cox.net; 24391 Totuava Circle, Mission Viejo, CA, 92691. Phyl cites Genealogical Gleanings from Highland & Monroe Townships, Muskingum County, Ohio for the burials of James and Electa. [S425] Phyl Stancill, "James and Electa Eno Holcombe," e-mail to Donna Holcomb Larose, 13 January 2000. Benoni Holcombe was born on 17 May 1787. He was the son of John G. Holcombe II and Jane Lamson. Benoni Holcombe married Annie Winchell on 16 October 1818. 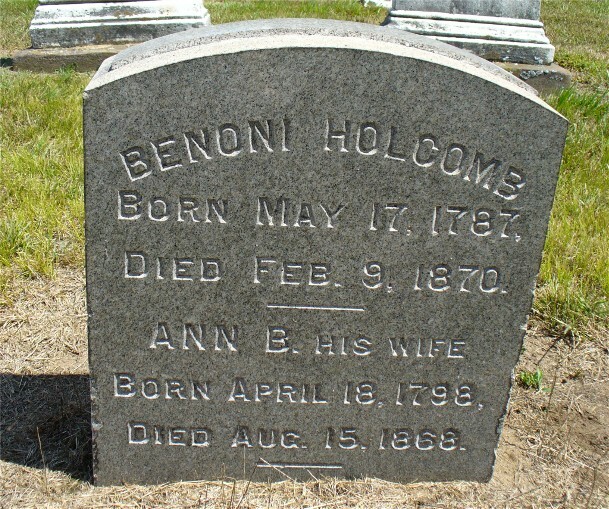 Benoni Holcombe died on 9 February 1870 at age 82. He was buried at Elm Grove Cemetery, Windsor, Hartford Co., CT.
Benoni and Ann Holcombe were enumerated in the 1850 Windsor, Hartford Co., CT federal census. He was a farmer age 63, she was 53. The only child in the household was James 19. Annie . . . buried Poquenock, Conn. cem. as recorded on her gravestone." [S25] Hannah McPherson, Holcombe Genealogy, Page 33.2/Item A-4-2-9-2-5-2. [S65] Deanna Holcomb Bowman Thomas Holcomb, Vol. II:Pg. 49/Item 426252. Pliny Holcombe was born circa 1793. He was the son of John G. Holcombe II and Jane Lamson. Pliny Holcombe died on 2 October 1820 at East Granby, Hartford Co., CT.
John Holcombe was born in March 1790. He was the son of John G. Holcombe II and Jane Lamson. John Holcombe died on 5 September 1868 at East Granby, Hartford Co., CT, at age 78. Isaac Holcombe was the son of John G. Holcombe II and Jane Lamson. Lucy Holcombe was the daughter of John G. Holcombe II and Jane Lamson. Lucy Holcombe married George N. Davis on 1 May 1823 at East Granby, Hartford Co., CT.
Information on Jane and her descendants is from Jeannie Barcus, via email, jbarcus@mwweb.com. Jane Holcombe was the daughter of John G. Holcombe II and Jane Lamson. Jane Holcombe died at Monroe Twp., Muskingum Co., OH. Annie Winchell was born on 18 April 1798. She married Benoni Holcombe, son of John G. Holcombe II and Jane Lamson, on 16 October 1818. Annie Winchell died on 15 August 1868 at Poquonock, Hartford Co., CT, at age 70. She was buried at Elm Grove Cemetery, Windsor, Hartford Co., CT.
Ann Colt was the daughter of Jabez Colt and Mary Morton. Ann Colt was baptized in 1699 at East Windsor, Hartford Co., CT.
[S141] Gale Ion Harris, "unknown short article title." [S147] Gale Ion Harris, "unknown short article title." Esther Colt was the daughter of Jabez Colt and Mary Morton. Esther Colt was baptized in 1701 at East Windsor, Hartford Co., CT.
Jabez Colt Jr. was born on 1 April 1703. He was the son of Jabez Colt and Mary Morton. Mary Colt was the daughter of Jabez Colt and Mary Morton. Mary Colt married Benjamin Post on 2 January 1734/35 at Saybrook, Middlesex Co., CT.
Lydia Colt was the daughter of Jabez Colt and Mary Morton. Mabel Colt was the daughter of Jabez Colt and Mary Morton. Dr. Harris notes that Benjamin's ancestry is in NEHGR, 147 :50-4, and the Addition in 147 :384. Benjamin Post was born on 3 January 1703/4 at Saybrook, Middlesex Co., CT. He married Mary Colt, daughter of Jabez Colt and Mary Morton, on 2 January 1734/35 at Saybrook, Middlesex Co., CT.
Orlin Dubert was born on 27 August 1866. He was the son of John B. Dubert and Betsy Ann Dibble. Orlin Dubert died on 31 May 1942 at age 75. William C. Dubert was born in 1869. He was the son of John B. Dubert and Betsy Ann Dibble. William C. Dubert died on 31 May 1912. Lena E. Dubert was born in February 1869 at Smithfield, PA. She was the daughter of John B. Dubert and Betsy Ann Dibble. Lena E. Dubert died on 9 November 1951 at age 82. Herbert A. Dubert was born in September 1871 at Smithfield, PA. He was the son of John B. Dubert and Betsy Ann Dibble. Flora M. Dubert was born in 1873. She was the daughter of John B. Dubert and Betsy Ann Dibble. Sophronia Amelia Dubert was born on 25 December 1874 at Smithfield, PA. She was the daughter of John B. Dubert and Betsy Ann Dibble. Sophronia Amelia Dubert married Levi Eleizen Williams, son of Uriah Williams and Sylvia Fletcher, on 29 August 1894. Sophronia Amelia Dubert died on 9 March 1959 at Springfield, PA, at age 84. She was buried at Grover Hill Cemetery, Springfield, PA.
Walter Andrew Dubert was born on 16 June 1876 at East Smithfield, PA. He was the son of John B. Dubert and Betsy Ann Dibble.